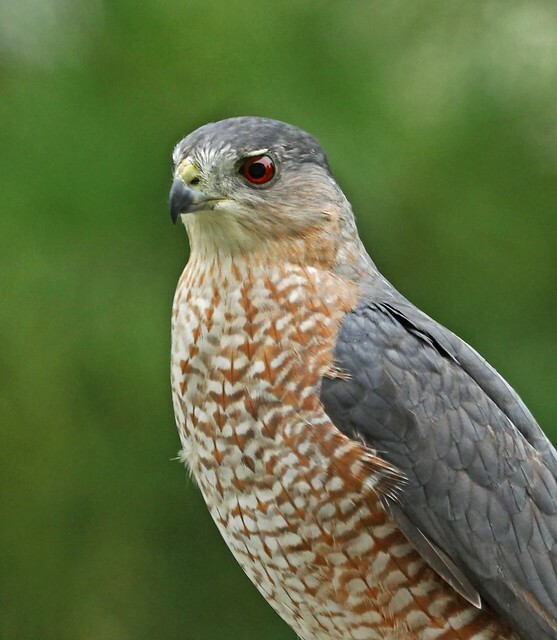 This is a medium-sized hawk. The cap and upper parts are bluish-gray. The nape of the neck is pale. The underparts are white with thin, horizontal, reddish-brown barring. Immature individuals are brown above with dark brown, vertical streaks on the breast and belly. The tail is relatively long and rounded at the end with a broad terminal band. It is bluish-gray above with black bars, pale below with dark bars. A loud cak-cak-cak-cak-cak lasting 2 to 5 seconds. When delivering food to the nest or receiving food at the nest the female makes a descending whaa call. 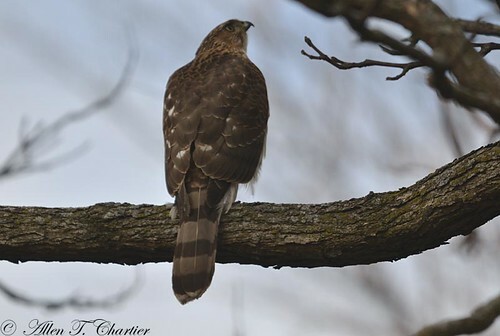 Sharp-shinned Hawk (Accipiter striatus) is smaller, no more than 12″ in length. The tail is more rounded and has a narrower terminal band. The nape of the neck is dark. Staking out a bird feeder in a suburban back yard. Female Cooper's Hawk photographed at Grand Forks, North Dakota (28 June 2009). Banded by Tim Driscoll and Tom Perry. An adult Cooper's Hawk (CAHA) giving the "whaa" call, from a leafless valley oak near Diablo Foothills Regional Park, Walnut Creek, California, 23 December 2015. 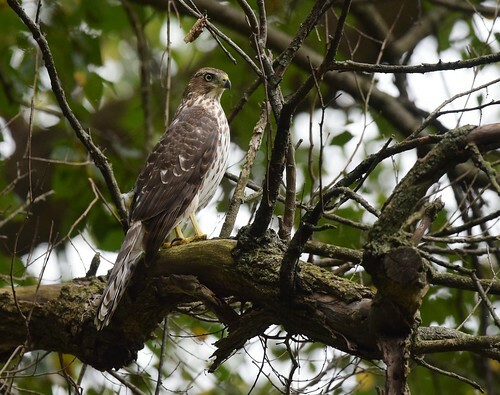 This hawk was responding to another bird, which we did not see, making the same call from deep in a live oak about 100 feet away. I have only heard this call during the breeding season near COHAs' nests. The Birds of North America states that this call is "primarily given by females".